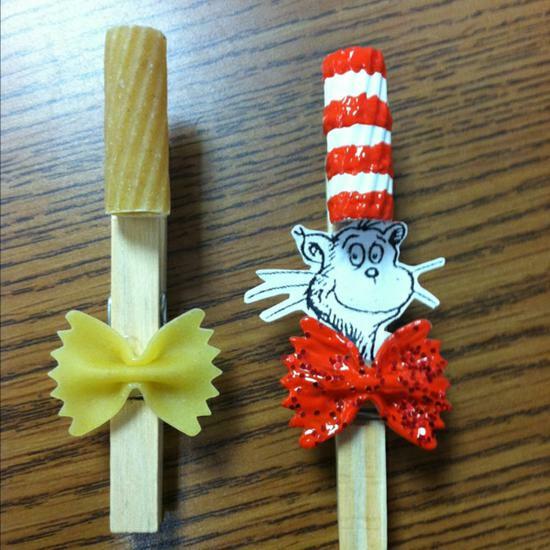 Home The Cat in the Hat Clothespin Craft! Suggestions from Sarah... 1) Use a hot glue gun to attach the pasta pieces to the clothespin before giving them to students, 2) while you can try other paint, puffy/fabric paint offers better control because it's a thicker consistency, and 3) you can find tons of free Cat coloring sheets/printables online, simply select your favorite and scale it down! Wondering how to use these fabulous crafts? Here are a few suggestions! Attach a magnet to the back, providing your kiddos with a fun way to display papers and projects on the refrigerator at home. Mount a piece of twine/ribbon on the front of your desk, along the window sill, or even on a bulletin board and use the Cat clips to display 'Seuss-tastic' student work throughout your Seuss unit. Glue a safety pin to the back to create a festive pin for Seuss day! Thank you Sarah for allowing us to share your awesome craft! For all of you Pinterest fans out there, be sure to check out/follow Sarah's school ideas and other pinboards!